God does all things well. Elaine knew it and she believed it, but the winds of sorrow that swept into her heart that day, were physically painful. Her son, Brent French, had lost his battle with the dreadful disease, cancer (large cell lymphoma). To put it simply, she was brokenhearted. Some have likened grief to standing in the shallows at a beach with large breakers hitting the shoreline. It can be very intense when a wave crashes over you, leavening you sputtering and gasping for air. Especially since more are expected to follow. Fortunately, the interval between waves of grief seems to lengthen with the passing of time. Do the waves of grief ever completely end? Remembering those who we have lost does not end until this life is over. When we have loved greatly, we grieve greatly. So what can you do when the loss is recent and your emotions are still raw? I advised once in a piece I wrote called “the Winds of Sorrow” these lines. When Brent was a senior in high school he heard a group of singers from Trinity Baptist College give a presentation. During the program he told his mother, Elaine, that he was going to marry one of the girls in the choir and he proceeded to point her out. She was a freshman at the college and since he had already applied to attend Trinity, and study music, he knew that the Lord had spoken to his heart about this young lady. How wonderful the grace of God is, when we run to Him with our hurting hearts and just soak a while in His presence. I know that Elaine met with her Savior to discuss her loss and frankly, to just cry in His arms. She is well experienced in this because she is not a novice in the ministry that had been her own life. As a pastor’s wife and widow, there had been many trips to the hospital and to the cemetery with people who were grieving deeply. She had also spent many hours with people whose lives had tragically fallen apart. Now it was her turn, again, to hurt on such a deep level. It was at this point that God began to speak to her heart about people she knew who needed a relationship with Him. God placed in her mind a list that He wanted her to work. First on the list was a family she met some years ago when she worked with mentally challenged adults. God gave her a burden for the father of one of her former clients. She used Facebook to find them and discovered that the father of the young man she had worked with, close to death. There was an urgency in this situation and she knew it was time to work the list. Elaine set up a visit and upon arrival was told by the family that his condition was so critical that he probably wouldn’t be able to communicate with her at all. When she started to talk, he suddenly became very alert. She was able to share the gospel and he was gloriously saved. It seems that God had opened this man’s mind just for her visit. He died three weeks after their encounter. She so grateful that God had used her and allowed her to witness that wonderful moment. Then it happened again! God burdened her heart about another family she had worked with whose son had died. “God help me find them” was her prayer. She did in fact find them and an appointment was set. When she arrived, she realized that a rough driveway and some dogs in the yard prevented her from getting to the house. The husband volunteered to drive his wife through the gate and to the car so she could meet with Elaine. After a few minutes together, the wife gave her heart to Jesus. It seems in these, and some other cases, that God had placed these people on Elaine’s list because He knew her heart would respond to His leading. He knew what a blessing it would be to her grieving heart to be a witness to these eternal events. He placed people on her list, so He could then place them on His list, the one that is written in the Lamb’s Book of Life. This wonderful process works, whether in times of great sorrow or in the everyday times of life. God wants to place people on your list. Your efforts, however, will not always result in a salvation experience. God wants us to show His love, to encourage them, and help you to be a blessing people. The question is are we willing to work the list God writes on our heart. In her suffering and sadness Elaine French worked the list and experienced the joy of seeing God work through her. Was she still sad about the loss of her son? Of course! Yet through it all, she has decided to keep working the list to God’s glory. In writing this story I realized that in the good times and the hard times, I need to work my list. If I do, God will keep adding names. How about you? 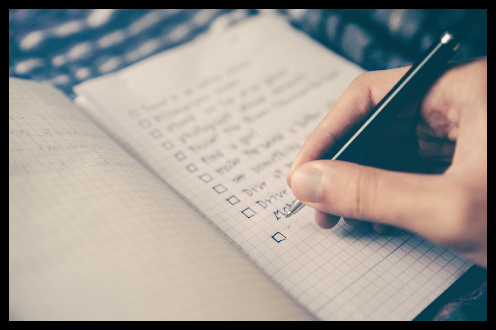 What are you going to do about your list? Isn’t God’s grace a wonderful thing! ?